Using a PMU, it is simple to detect abnormal waveform shapes. A waveform shape described mathematically is called a phasor. See my post Wide Area Situation Awareness for a description of how this technology is being deployed. The inherent latency in grid monitoring is an important issue; a delay of 2 seconds or more before a grid operator sees an event is not uncommon, and this may be too late to take action to control system instability, leading to a blackout. Popularly referred to as the power system’s “health meter,” Phasor Measurement Units (PMU) sample voltage and current many times a second at a given location, providing an “MRI” of the power system compared to the “X-Ray” quality available from earlier Supervisory Control and Data Acquisition (SCADA) technology. Offering wide-area situational awareness, phasors work to ease congestion and bottlenecks and mitigate – or even prevent – blackouts. Typically, measurements are taken once every 2 or 4 seconds offering a steady state view into the power system behavior. Equipped with Smart Grid communications technologies, measurements taken are precisely time-synchronized and taken many times a second (i.e. 30 samples/second) offering dynamic visibility into the power system. Time-synchronized measurement devices, referred to as “phasors” or “synchrophasors,” have the potential to significantly improve transmission reliability. 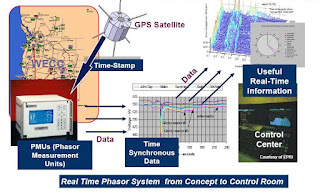 Synchrophasors take data snapshots of system voltage, current, and frequency and time-synchronize the measurements with Global Positioning System (GPS) timing. The resulting data allows grid operators to see dynamic conditions on the grid in a more real-time manner and with greater accuracy and resolution than possible with current technologies. The result is greater reliability through better system control and early detection and mitigation of potential grid disturbances. Angular Instability – A low-frequency (usually less than 1 Hz) undamped power fluctuation traveling from one end of a power grid to the other end. This traveling wave cannot be easily damped and can take up significant capacity on transmission lines. GPS Radio Clock – In a typical application, phasor measurement units are sampled from widely dispersed locations in the power system network and synchronized from this common time source. GPS time stamping can provide a theoretical accuracy of synchronization better than 1 microsecond. “Clocks need to be accurate to ± 500 nanoseconds to provide the one microsecond time standard needed by each device performing synchrophasor measurement. Harmonics - Variations in the wave shape. Electronic filters can remove harmonics. IED –Intelligent Electronic Device - A microprocessor-based controller of power system equipment, for monitoring and control of automated devices. IEDs receive data from sensors and power equipment, and can issue control commands, such as tripping circuit breakers if they sense voltage, current, or frequency anomalies, or raise/lower voltage levels in order to maintain the desired level. Common types of IEDs include protective relaying devices, load tap changer controllers, circuit breaker controllers, capacitor bank switches, recloser controllers, and voltage regulators. A typical IED can contain around 5-12 protection functions, 5-8 control functions controlling separate devices, an auto-reclose function, self monitoring function, and communication functions. Inter-Area Oscillation Damping - Low frequency Inter-area oscillations are detrimental to the goals of maximum power transfer and optimal power flow. An available solution to this problem is the addition of power system stabilizers to the automatic voltage regulators on the generators. The damping provided by this technique provides a means to minimize the effects of the oscillations. Although Power System Stabilizers exist on many generators, they effect is only on the local area and do not effectively damp out inter-area oscillations. It can be shown that the inter-area oscillations can be detected through the analysis of phasor measurement units (PMU) located around the system. Nonzero high-frequency impedance (when a load demands a large amount of current, then stops demanding it suddenly, there will be a dip or spike in the voltage due to the inductances in the power supply line. NASPI - North American SynchroPhasor Initiative - Working to advance the application of information and communications systems within the electric power industry. Overvoltage - Occurs when the nominal voltage rises above 110% for more than 1 minute. A surge protector or simple capacitor or varistor can protect against most overvoltage conditions. PDC - Phasor Data Concentrators - Collect the information The PDC correlates the data, and controls and monitors the PMUs (from a dozen up to 60). PMUs often use phone lines to connect to PDC, which then send data to the SCADA and/or Wide Area Measurement System (WAMS) server. Phasor - A complex number that represents both the magnitude and phase angle of the sine waves found in electricity. - In physics and engineering, a phase vector, or phasor, is a representation of a sine wave whose amplitude (A), phase (θ), and angular frequency (ω) are time-invariant. Phasors reduce the dependencies on these parameters to three independent factors, thereby simplifying certain kinds of calculations. Using phasors, the frequency factor can be factored out, leaving just the static amplitude and phase information to be combined algebraically (rather than trigonometrically). Similarly, linear differential equations can be reduced to algebraic ones. The term phasor therefore often refers to just those two factors. Phase Difference - Analogous to two athletes running around a race track at the same speed and direction but starting at different positions on the track. They pass a point at different instants in time. But the time difference (phase difference) between them is a constant - same for every pass since they are at the same speed and in the same direction. 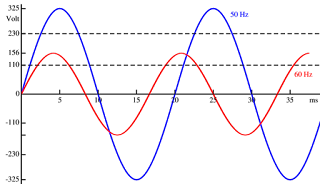 If they were at different speeds (different frequencies), the phase difference is undefined and would only reflect different starting positions. Phasor Data Gateway – The unifying concept that will allow hardware and/or software vendors to interface to NASPInet, either as a publisher or as a subscriber. PMU - Phasor Measurement Unit - Measures the electrical waves on an electricity grid to determine the health of the system. In power engineering, these are also commonly referred to as synchrophasors and are considered one of the most important measuring devices in the future of power systems. A PMU can be a dedicated device, or the PMU function can be incorporated into a protective relay or other device. PMUs help identify remote system disturbances in advance to prevent wide-scale power outages. For 60HZ systems, PMUs must deliver between 10 and 30 synchronous reports per second depending on the application. Power Conditioning - modifying the power to improve its quality. Power Quality - A set of boundaries that allows electrical systems to function in their intended manner without significant loss of performance or life. The term is used to describe electric power that drives an electrical load and the load's ability to function properly with that electric power. Without the proper power, an electrical device (or load) may malfunction, fail prematurely or not operate at all. There are many ways in which electric power can be of poor quality and many more causes of such poor quality power. PSO - Power System Outlook - A real-time tool that enables operators and engineers to quickly and affordably analyze phasor measurement system data. RFC – Remote Feedback Controllers - In a typical implementation, one or more of the generators in a system are selected as RFC. The RFC received synchronized phasor measurements from one or more remote phasor sources. The RFC analysis the phase angles from the multiple sites and determines if an inter-area oscillation exists. If an oscillation exists, a control signal is sent to the generator’s voltage regulator that effectively modulates the voltage and effectively damps out the oscillations. SCADA - Supervisory Control and Data Acquisition - An industrial control system: a computer system monitoring and controlling a process. The conventional technology used by grid operators for monitoring the grid. A Human-Machine Interface or HMI is the apparatus which presents process data to a human operator, and through which the human operator monitors and controls the process. SE - State Estimation - Application that uses SCADA data to determine and display the state of the power system. IEEE C37.118 - The current primary standard for the communications of phasor measurement unit (PMU) and phasor data concentrator (PDC) data and information which was published in 2005. This standard also includes requirements for the measurement and determination of phasor values. IEC 61850 - The key standard for all substation and field equipment operating under both real-time and non-real time applications. The use of IEC 61850 for wide-area communication is already discussed in IEC 61850-90-1 (Draft technical report) in the context of communication between substations. It appears possible to use a similar approach for the transmission of PMU and PDC data but the capability needs to be formally defined in IEC 61850. IEEE 1588 - Available to achieve highly accurate synchronization over a communication network however an implementation profile for power system applications is required. Time Error – An accumulated time difference between control area system time and the time standard. Time error is caused by a deviation in interconnection frequency from 60.0 Hz. Time Error Correction - An offset to the interconnection’s scheduled frequency to correct for the time error accumulated on electric clocks. Synchrophasor data enable the determination of grid stress and can be used to trigger corrective actions to maintain reliability. Some applications use synchrophasor data to create the situational awareness for operators to detect sub-second phenomena across the power system. System stress across a wide area or an instantaneous measure of power system dynamics, such as swings, can be recognized nearly instantaneously using such highly accurate data. Metaphorically, synchrophasor technology is like an MRI of the power system, as compared to an X-ray image provided by traditional SCADA technology. Because of instantaneous, high-resolution and more-detailed measurements, PMU data are well suited as input to activate local or centralized automated controls. Such use of synchrophasor technology for wide-area monitoring and control will facilitate the evolution of the existing grid into a smarter transmission grid. Common time synchronization is the key to many Smart Grid applications for real-time operation necessary to make the Smart Grid highly robust and resilient to disturbances (“self-healing”), either from natural events such as earthquakes or large variations in wind or solar power availability, or from potential terrorist actions. Guidelines on how to achieve that synchronization and addressing different issues related to that synchronization are required. Sensors and digital relays installed on power lines will enable utilities to operate transmission and distribution systems with greater efficiency and reliability. Today’s supervisory control and data acquisition systems, for example, typically provide data on the state of transmission lines every four seconds. The Smart Grid, through, increased deployment of advanced sensors like Phasor Measurement Units will give bulk-power system operators access to large volumes of high-quality information about the actual state of the electric system. Bridging the communication standards for synchrophasor data from current to more feature rich standards which will accelerate the implementation of the Smart Grid. Expected benefits include reduced capital and lifecycle costs, improved reliability and the enablement of new applications. Reduced Transmission Congestion Costs – Due to increased transmission transfer capability without building additional transmission capacity. Increased Transmission Capacity - Synchrophasor data could be used to allow power flow up to a line's dynamic limit instead of to its worst case limit. Reduced Outages - Phasor technology enables real-time system monitoring and reduces the probability of major disturbances. Phasor measurement units (PMUs) help identify remote system disturbances in advance to prevent wide-scale power outages. Real-Time Data - Phasor Measurement Units will give bulk-power system operators access to large volumes of high-quality information about the actual state of the electric system that should enable a more efficient use of the electric grid, for example through a switch from static to dynamic line ratings addressing transmission congestion and optimization of the system. Angular Instability Control - If the low-frequency oscillation could be damped, the transmission line capacity could be restored making it easier to relieve congested lines or reduce possible grid instability. In the past, this type of instability has been linked to wide-scale regional blackouts costing billions of dollars in lost productivity, goods and services. A flywheel energy storage system, combined with phasor measurements and an integrated communications and control network, has the potential to overcome this vulnerability and prevent such blackouts. Early Warning - Analysis conducted by the Pacific Northwest National Laboratory (PNNL) of the August 10, 1996, blackout indicates that a Phasor Measurement Unit (PMU)-based Wide Area Measurement System (WAMS) could have provided a 6-minute warning prior to separation of the then-Western System Coordinating Council (WSCC) system into four islands. With a lead time of six minutes, the opportunity exists for real-time control actions designed to damp out the system oscillations. In the case of the August 10, 1996, blackout, system separation might have been avoided if the oscillations of the California-Oregon Intertie had been damped to a sufficient degree. Damping of oscillations may be achieved by fast injection of real and reactive power at a frequency similar to that of the oscillations. Inconsistent Standards - Two standards are related to communications of phasor measurement unit (PMU) and phasor data concentrator (PDC) data and information. IEEE C37.118 was published in 2005 for PMUs. IEC 61850 has been substantially developed for substations but is seen as a key standard for all field equipment operating under both real-time and non-real time applications. There are significant differences in scope and content of the two standards. Integrating IEEE C37.118 with IEC 61850 will help to remove overlaps between the standards, which may impede development of interoperable equipment and systems. Inaccuracy - PMUs from multiple vendors can yield inaccurate readings. In one test, readings differed by 47 microseconds- or a difference of 1 degree of at 60HZ- an unacceptable variance. China's solution to the problem was to build all its own PMUs adhering to its own specifications and standards so there would be no multi-vendor source of conflicts, standards, protocols, or performance characteristics. 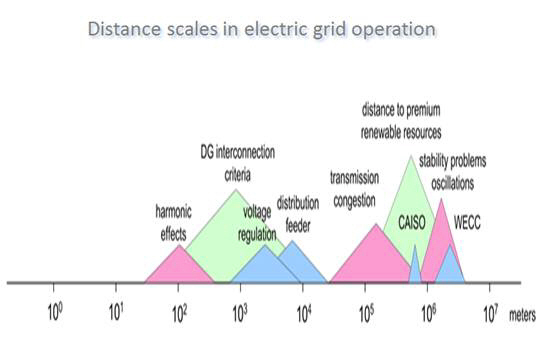 Complexity - The growing complexity of interconnected electric grids increases the threat of blackouts and other operational challenges, facilitating the need for a smarter electric grid equipped with wide-area measurement units to monitor large grids. Renewable Energy on the Grid - High Renewalable Portfolio Standards RPS alters system dynamics in a fundamental way, especially when fewer conventional generators are on line. Lack of inertia and governor response, different excitation; different locations of renewables. Network Speed - Phasor measurement monitoring system requires high-speed communications for its most useful applications of system protections (a few seconds) to system state calculation (a few minutes). Phasor Measurement Units must have voltage (3-phase) and time synchronization in order to compute phasors. Time synchronization must be tight enough to maintain acceptable drift in local time keeping devices and maintained to IEEE 1588 Standards or better. Wide area communications must meet latency and real-time applications requirements for WASA based applications. Remote Feedback Controller must have valid secure communications from the remote sites; the controlled generator must be up and running with validation of status. Topology and other processing must be able to integrate data from field equipment up to EMS systems and environments. Collaborating with the Smart Grid community, NIST categorized priority actions to define challenges to and objectives for developing interoperability for the Smart Grid. Each of eighteen priority action plans listed below are linked to key standards organizations and users associations interested in specific Smart Grid standards. Harmonization of IEEE C37.118 with IEC 61850 and Precision Time Synchronization is Priority Action #13. IEEE Standard C37.118 which was published in 2005 is the current primary standard for the communications of phasor measurement unit (PMU) and phasor data concentrator (PDC) data and information. This standard also includes requirements for the measurement and determination of phasor values. IEC 61850 is the key standard for all substation and field equipment operating under both real-time and non-real time applications. The use of IEC 61850 for wide-area communication is already discussed in IEC 61850-90-1 (Draft technical report) in the context of communication between substations. It appears possible to use a similar approach for the transmission of PMU and PDC data but the capability needs to be formally defined in IEC 61850. This action plan seeks to assist and accelerate the integration of standards that can impact phasor measurement and applications depending on PMU and PDC based data and information. Develop strategies to migrate legacy standards to meet lower latency requirement for substation and transmission tie stations. Harmonize the “next generation” suites of standards that meet Smart Grid requirements, such as IEC 61850 with the CIM standards, IEC 61970 and 61968 and more demanding Quality of Service requirements of NASPInet. Develop new communication protocols such as the NASPInet GridStat for wide area monitoring using phasor measurement units. North American SynchroPhasor Initiative - Working with DOE to advance the application of information and communications systems within the electric power industry. Zhenyu H, B Kasztenny, V Madani, K Martin, S Meliopoulos, D Novosel, and J Stenbakken. July 2008. "Performance Evaluation of Phasor Measurement Systems." Power and Energy Society General Meeting - Conversion and Delivery of Electrical Energy in the 21st Century, IEEE , vol., no., pp.1-7, 20-24. Becker D. May 2010. EPRI: Harmonizing the International Electrotechnical Commission Common Information Model (CIM) and 61850 Key to Achieve Smart Grid Interoperability Objectives.